At Ceciliyan, we do believe that expertise would lead to excellence if only we walk the talk. As buyers had ever so often bid all-time record prices at the Colombo tea auctions for our teas, then surely, we may have got most things, if not all aspects right in the growing and production process! Team- work and good communication has resulted in every individual knowing his or her goals, harmonized with that of the organization. We believe that whatever we achieve and the way in which we achieve it, would ultimately set benchmarks for the industry. Gold Award in the low grown category, by the Tea Exporters Association of Sri Lanka. With all humility we venture to state that being the Best among 125 tea factories in Sabaragamuwa region, speaks volumes on our behalf. Implementation of consistent and pragmatic strategies led to an enhanced bottom-line, which led to stakeholders’ satisfaction and motivation. 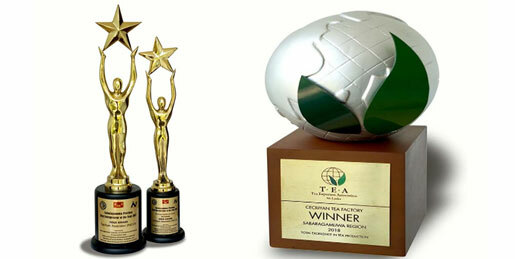 1st Runner-up Award by the Tea Exporters Association of Sri Lanka. The year was a watershed for the company and our MD/CEO, reflecting hard work and pursuit of excellence. We were reminded in no uncertain terms that ‘perseverance pays’! We believed in doing the right things at the right time and then, doing them right, which naturally, paid rich dividends. Awarded by the Sabaragamuwa Chamber of Commerce & Industry. He was a dreamer, who dared to transform a traditional family-run business into a modern, efficient and professionally- run organization. A quietly efficient Mr. Paani Dias, the MD/CEO’s achievements, personify the work-ethic within the company, resonating well with his past; having been a sportsman of no mean repute.